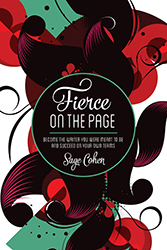 "In Fierce on the Page, internationally acclaimed writing guide Sage Cohen invites writers to name and claim their deepest desires, identify and eliminate the things that interfere with their writing, and move toward achieving their writing goals through a series of invigorating contemplations, exercises and prompts. Readers will gain a greater appreciation for how fierce they are today and a comprehensive arsenal of strategies, skills and attitudes that align them with satisfaction and success on their own terms. Sage Cohen ’91 is the author of The Productive Writer, Writing the Life Poetic, and the poetry collection Like the Heart, the World. She has been nominated for a Pushcart Prize and hosts the Fierce on the Page reading series in Portland, Oregon.